The Jordan River is located in the northwestern part of the Lower Peninsula of Michigan. 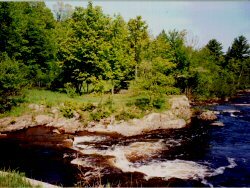 The mainstream is 33 miles in length with headwaters in northwestern Antrim County, from whence it flows southwesterly to the center of the county, flowing north by northwesterly through the county and the southern part of Charlevoix County. It empties into the South Arm of Lake Charlevoix at the Village of East Jordan (Figure 1). The river has two major tributaries, the Green River and Deer Creek with numerous minor tributaries to both the mainstream and Deer Creek.